WHAT IS AN ANKLE FRACTRUE LIKE? WHY DO I GET AN ANKLE FRACTRUE? WHAT DO I DO ABOUT AN ANKLE FRACTRUE? HOW IS AN ANKLE FRACTRUE TREATED? WHAT IS AN ANKLE FRACTURE LIKE? Julie was just getting into shape and she had lost 10 lbs. Only 10 more to go. She had just passed her 42nd birthday and had resolved to finally loss those pounds that had accumulated over the years. Now the kids were finally old enough that she could get away for thirty minutes to walk the dog and maybe get into good enough condition to run consistently without loosing her breath. It was going great and then it happened. Looking back, it was so dumb. All she did was look away for a minute and then “wham”, she turned right over the edge of the concrete sidewalk and her rolled over. Thank god that it was right in front of her best friend, Tracy’s, house. She couldn’t put an ounce of weight on it without pain searing the outside of her ankle. The ankle joint is out of position due to the fracture of the fibula and tearing of the deltoid (tibia/medial malleolus to talus) ligament. This will not work properly if allowed to heal like this. Now, back at home, her ankle was turning colors and the portion on the outside looked like it was pregnant with a softball. She could feel her pulse in her ankle and the pain was getting worse. She knew that she had to go to the emergency room, but she couldn’t help but think about how it was going to rearrange your life. The plans and goals that she had made were going to have to be put on the shelf for a while. She thought about how difficult it was going to be to drive, to get to the grocery store and cook, and to get to work… Work! What was she going to do about work. Her boss in the dental office depended upon her; she was the head hygienist. How was she going to ensure that everything runs smoothly? This was going to be rougher than she thought. The ankle allows the foot to rotate on the shin. It rotates to allow you to point your toes so that you can come up on your tip toes or to rock back on your heels. It’s movement allows you to push and to accelerate your step so that you can run and so that your step is smooth and fluid. It is composed of three bones, the fibula, which is the small bone on the outside of your foot, the tibia or the shin bone, and the talus, which is the bone within the foot that the tibia and fibula surround. It is a hinged joint. The structures that stabilize the ankle and bind it together are the ligaments. There are ligaments on both the inside and outside portions of the ankle joint. The outside ligaments attach to the fibula and are called the anterior talofibular ligament, the posterior talofibular ligament, and the calcaneofibular ligament. The ligament on the inside of the ankle is called the deltoid ligament and attaches to the end of the tibia or medial malleolus in a fan shape. There is one more important ligament, the syndesmodic ligaments which bind the tibia and fibula together. The surfaces of the tibia, fibula, and talus that move against one another are covered with joint cartilage. Joint cartilage is a very fragile and complicated tissue. 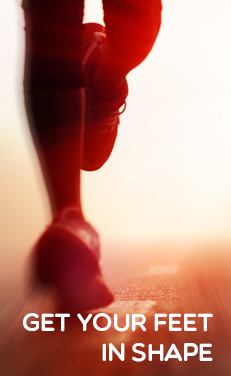 It is at the same time very smooth, so that the surfaces can rub against one another with very little friction, and able to absorb stresses, like the pressure and impact of your full body weight when running. The joint surfaces fit together like a hand in a glove. Unfortunately, if this is disturbed, it can go on to irreparable damage. An ankle fracture is an injury of the malleolus or sides of the joint. Usually joint injuries that involve the weight bearing portion of the ankle are called pilon fractures and usually the outcome of these fractures is worse than ankle fractures. Fractures of the talus are also considerably more complicated than ankle fractures. 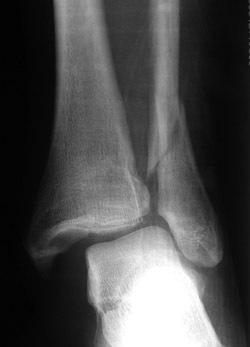 This ankle fracture is unstable because the ligament on the inside of the ankle no longer function due to the fracture of the tibia (left) and the ligaments that bind the tibia to the fibula are torn. An ankle fracture however is much more than an injury to the bone. In order to fracture the ankle, you also have to injure the ligaments and joint capsule that surround the ankle joint. If you were able to take a picture or x-ray of the ankle at the moment of the injury, the ankle joint would most likely be nearly completely dislocated, the joint would be completely pulled apart. Sometimes other structures such as nerves, tendons, and the joint surfaces themselves are also injured at the time of the ankle fracture. It is possible, even likely, to have numbness, tendinitis, and joint bruises or bone contusions at the same time of the ankle fracture. Avulsion fractures are a common and much less serious form of ankle fracture. Avulsion fractures are very small fragments that are pulled off bones in the process of ankle ligament injuries or sprains. If you were to do surgery and look at the ligament directly (which is almost never necessary after these injuries), you would see a small fragment of bone attached to the torn ligament. It would be possible that it would not be very obvious unless you felt around on the ligament. Radiographs however image small bones much better than they do soft tissues such as ligaments, so these small fragments of bone are very obvious on radiographs. It gives these fragments the appearance that they are “loose”. In fact, they are securely attached to the ligament and are not liable to become displaced or loose within the joint. A stress fracture is an injury that occurs not from a single force but from repetitive force that eventually causes the bone to break. This is also called fatigue fracture. Essentially what happens, is that these small repetitive forces overwhelm the body’s ability to repair them either because too much damage is being done or because the damage is occurring too fast. 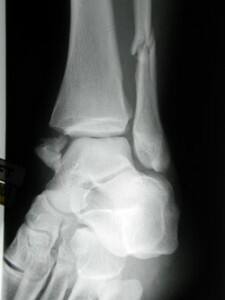 In this rare injury, a fracture or bony injury may occur without a definite trauma such as it fall or wrench of the ankle. An ankle fracture is a rotational injury. This means that these injuries usually occur when the ankle is suddenly twisted or turned around its joint. Since the fibula and tibia surround the talus on three sides, when the joint is twisted it tends to shear the parts of the tibia and fibula that go around the talus off. Many people seem surprised that this can happen after a fairly minor injury. The analogy that I think conceptualizes this the best is that of tearing a phonebook. If you try to tear a phonebook, you will find it impossible without superhuman force. If you fan the pages and more or less start tearing them sequentially, then it is possible for even someone with modest strength to tear a fairly thick phonebook. It does not take a particularly large amount of energy to break the normal ankle. However, conditions that we can the bone such as osteoporosis can make it much easier to break the ankle. Osteoporosis is a very common contributing factor to ankle sprains. COULD IT BE SOMETHING OTHER THAN AN ANKLE FRACTRUE? An ankle fracture almost never occurs without trauma. However, there are a number of other injuries that can occur. Talus fractures including talar neck and osteochondral fractures of the talar joint surface. Pilon fractures. These fractures involve a great deal of force such as a fall from a height or motor vehicle accident. Tendinitis including posterior tibial, peroneal, Achilles, anterior tibial tendinitis. Ankle pain due to ankle malalignment, flat feet or high arched feet. As described above, if you were able to take a radiograph or picture of the ankle at the time that it was fractured, what you would get would be rather grotesque. The ankle would likely be dislocated or pulled apart to some extent. This is probably the most important consideration in treating the ankle, its stability. The ankle joint must be perfectly aligned in order to heal properly. If it is properly aligned, it is likely that the ankle will function and feel nearly normal after the joint is been healed. If it is not properly aligned, it is likely to go on to arthritis and chronic deformity which will lead to persistent pain. So, ankle fractures can to be divided into the stable ones which probably don’t need surgery, the unstable ones which probably do need surgery, and the ones that are in between which require the judgment of an experienced physician to treat. Swelling is always a part of an ankle fracture. Swelling occurs because there is bleeding into the tissue which occludes the lymphatic system. The chemicals which the blood clots and injured tissue release cause the blood vessels and capillaries to become leaky. This leakiness allows serum to leak into the tissues. In addition, the blood vessels dilate around the injury in order to bring nutrients and oxygen in. This engorgement of the tissue with blood will increase its volume. Sometimes the swelling is moderate, sometimes the swelling is severe. While some swelling is unavoidable, it is best to do something to help with swelling that gets to be extreme. Let’s begin with the eponym RICE which stands for Rest, Ice, Compression, and Elevation. Rest is probably very necessary for an injury. However, this does not mean that you have to be completely bedbound. A short period of activity, such as going to the bathroom or getting yourself something to eat from the kitchen, is unlikely to hurt you over the long run. Ice does very little to help with swelling. It is impossible using an ice bag or bag of frozen peas to change the temperature of the tissue that is injured deep within your ankle. Even using sophisticated cooling machines has not been shown to have a great impact on swelling. Compression with an Ace wrap does little more Than place creases on your leg and cause the area of the extremity that is not compressed by the Ace wrap to become swollen. Using a compressive stocking, such as a Jobst stocking is a much more effective method of compressing this extremity. However, it can be a challenge to place a stocking around a swollen and fractured extremity. Many people find the compression to be uncomfortable also. Elevation is the most reliable and simplest method of controlling swelling. Elevation at the level of the heart is effective. Elevation beyond this level is not necessarily more effective. Pain medications including acetaminophen (Tylenol) or anti-inflammatory medications (e.g. Motrin or Aleve) can be effective ways of helping control pain, but it should be realized that these medications most likely do very little to actually cure an ankle fractrue. The benefit of taking these medications is for their ability to help with pain and little else. If they do not significantly decreased pain, there is probably very little benefit to taking them. In addition, all these medications have significant side effects that may make them dangerous if taken over a long period of time. Some of them have even been taken off the market because of concerns that they may increase the possibility of heart attack. Even the over-the-counter brands of anti-inflammatories may have this risk. It is fairly common for blood pressure to be more difficult to control when these medications are taken. Anti-inflammatories may interfere with the benefits of taking low-dose aspirin for cardiovascular problems. Applying ice and heat to an injury is an excellent way of helping with discomfort, but it is unlikely that it actually helps with healing. Studies have been done (reference) which have shown that application of the ice to the skin is not affect the temperature of the tissue very deep beneath the surface of the skin. So even if cooling healing tissue has some benefit, and there is very little evidence of this, placing ice on the surface of the skin is not do this. What ice and heat do is to stimulate the nerves that detect cold and hot in the skin. The stimulation of these nerves affects the perception of pain by our brains or our ability to sense the discomfort, so we simply feel it less. So when the question comes up “what should use, a heat pack or an ice pack?”, the answer is whatever feels better and only for as long as it helps with the discomfort. If an ankle fracture is stable, a cast boot or cast may accomplish many things. First, it will avoid re-injuring the joint. The foot will not function quite right after a fracture due to the swelling, and bleeding into the tissues. It will be extra difficult to position it properly. A boot or cast may help you reduce the chance of rolling the ankle, which will be uncomfortable at the very least. It will also decrease the motion of the ankle which will be uncomfortable in the initial recovery. Open reduction and internal fixation is necessary when the bones are out of place or the ligaments are torn so that the ankle is no longer stable. If the ankle does not heal perfectly, it could go on to arthritis very quickly or lead to deformity. 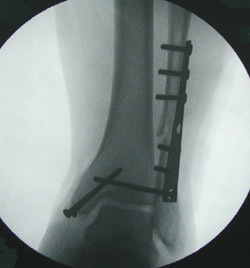 Open reduction and internal fixation involves opening up the fractures through a surgical incision and removing any bone chips, soft tissue, or clots that may have gotten into the break, placing the bone fragments into normal position and using devices such as metallic screws and plates to hold them into proper alignment until they heal. Usually, these devices do not give the bones enough immediate strength to allow for walking, but when the bones heal the joints should be strong enough to walk on safely. This may take from between 4-8 weeks. Ankle fractures associated with ligament injury substantial enough to affect the alignment of the ankle generally require fixation with orthopedic hardware.